Here’s Elisabeth wearing a wrap dress in another lovely Tana lawn fabric, again kindly donated to Kit’s Couture by my friend Christine. The all-over floral print is in soft summer shades of mauve, pink and amber, which flatters Elisabeth’s (and Kit‘s) Summer colouring. 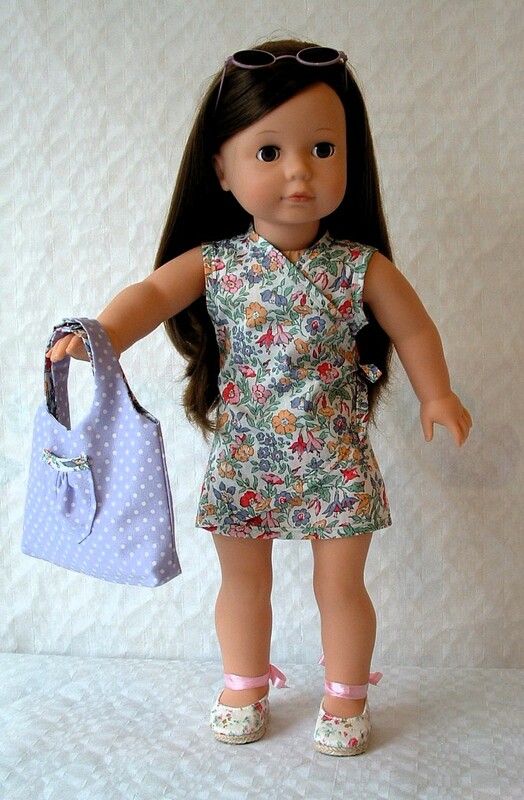 The dress pattern is by Ardently Admire Doll Attire, and available to download from Pixie Faire. Elisabeth wears it with some pretty floral espadrilles with pink ribbon ties, by Sophia’s, which complement the dress perfectly. I was attracted by this pattern which seemed a little bit different. For a start, there’s no velcro – it fastens with a side tie. And I liked the fringing around the hemline which was quite an unusual feature and I thought just right for a light summer dress. So I cut out the dress and began construction. After joining the shoulder seams, I moved into uncharted territory as I cut bias strips to bind the edges of the armholes, neckline and fronts. I’d used bias binding in the past, but never cut my own bias. However, the instructions with the pattern were very clear and easy to follow, so I had no problem at all doing this, and the results were good. the thread into the bottom of the garment. So I get eyebrow tweezers from upstairs, struggle on for about half an hour, mangling the fabric with tweezers, create three inches of messy and unconvincing fringe, look at what remains to be done – another 9 inches or so – and decide perhaps Tana lawn is just too finely woven to unravel easily into a fringe, and more to the point, for me at this particular moment, life’s too short. Certainly, Ms Elisabeth, one beach bag coming up! The beach bag is made using the Emma Tote pattern from Bonjour Teaspoon, once again available from Pixie Faire. I used some mauve polka-dot fabric from my stash, and lined it with the same Tana lawn I used for the wrap dress. The instructions for making up the bag are very clear and it came together well. The most fiddly part is the little pocket on the front, which has to be gathered into a bound top and then topstitched onto the bag itself. It’s not easy to get the pocket symmetrical and evenly stitched! But it’s fine, and Elisabeth is delighted with the results. So what’s the verdict on the finished dress itself? 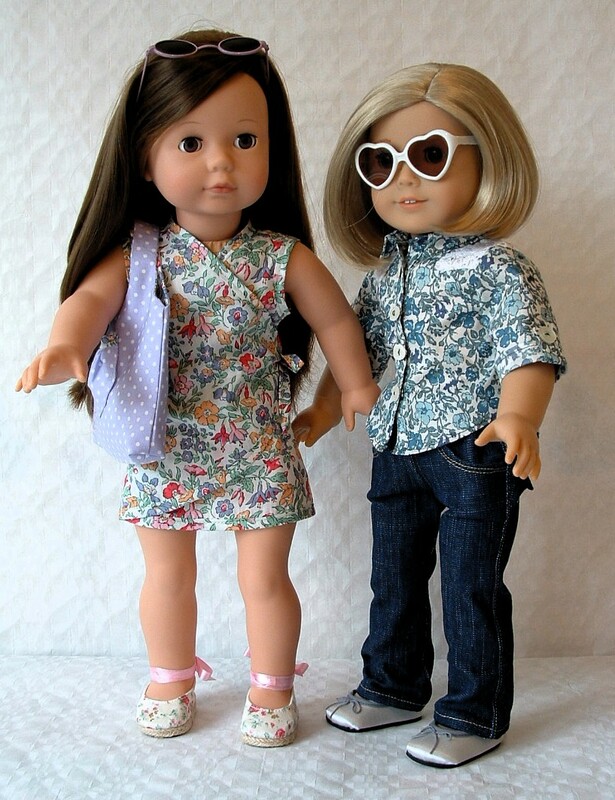 To be absolutely fair, the dress is designed for American Girl, and Elisabeth is a Precious Day girl from Gotz, so I felt I had to see it on Kit too before passing judgement. But since American Girl and Precious Day girls have the same body and limbs, I didn’t expect it to look any different, and I was right. It fits Kit nicely, and is a real addition to the girls’ shared wardrobe. And what about the fringing? Would I have another go at that? Well, perhaps, with a thicker cotton material, but I would definitely practice first on a spare piece first of all to perfect my technique. But in spite of my problems with the fringing, I do like the dress very much. The shoulders are cut wide enough to hide the arm joints, and the flared skirt of the dress is very well done. 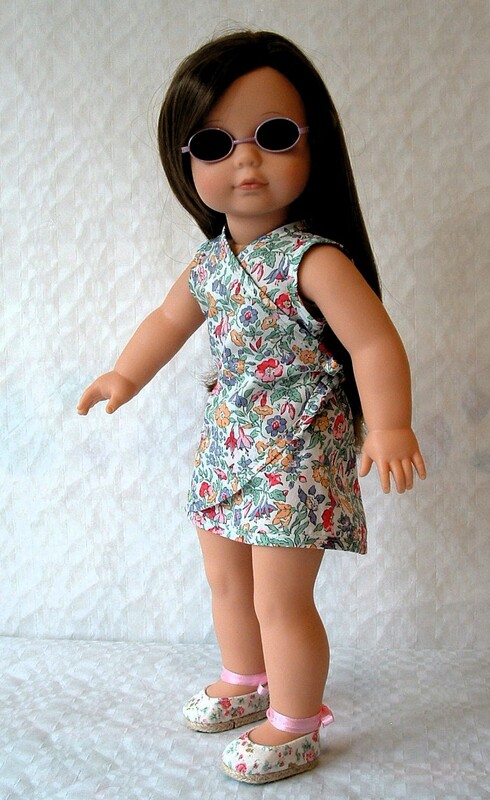 American Girl and Precious Day girls can look a bit dumpy, to be honest, but this is a very flattering little dress which emphasises their waists and skims the hips nicely. To finish, here’s Elisabeth all ready for the beach, and an advance glimpse of Kit’s new shirt in another lovely Tana lawn fabric, the subject of another blog in a week or two. Beach dress and tote – and a sneak peek at Kit’s new shirt.